This is the last recorded lynching in S.C. and the South. On the night of February 15, 1947, white cabdriver Thomas W. Brown was found mortally wounded beside his cab. 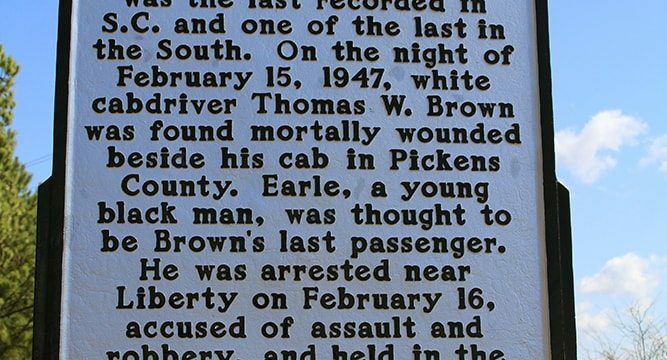 Earle, a young black man, was thought to be Brown’s last passenger. He was arrested, accused, and held in the Pickens County Jail. 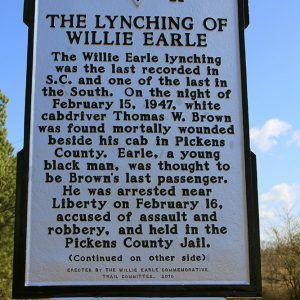 Early on February 17, 1947, a white mob took Earle out of the jail, drove him to Greenville and lynched him. Although rare for the era, 31 men were accused and the trial that was held in May drew national attention. 26 men admitted being part of the mob, still an all-white jury acquitted all defendants. Marker erected by the Willie Earle Commemorative Trail Committee, 2010.